With the new addition of the baby girl to our family, I decided I wanted to make some homemade baby bibs. I thought the process would be difficult, but once I got started...I realized how easy it was to create my own bibs for our grand-daughter. Lay your pre-purchased baby bib down on a piece of white paper and trace around the shape using a pencil, then cut out your paper pattern. Next, unroll your bias tape and cut off a piece of bias tape measuring 34" in length. Pin your paper pattern down onto your terry cloth fabric and pin into place. Cut around the paper pattern and then remove the pins. Cover and pin the bias tape around the raw edges of the sides and bottom of your bib, don't cover the neck area just yet. Using your sewing machine, stitch the bias tape into place and fasten off. Cut another piece of bias tape measuring approximately 26" long. Attach the center of the bias tape to the center neck area of the bib, pin into place. (note: a piece of bias tape about 10" long is left at both ends of the neck edge for the ties.) Using your sewing machine, stitch around the neck opening so that you are attaching and covering the raw edges. Decorations: If desired, you can use 3/4" wide eyelet lace instead of bias tape in step one of the sewing, but you will still need to use a coordinating color of bias tape for the neck area and ties. You can embroider a name or nice design onto the front of the bib or purchase some cute iron-on applique's. There are many fun sewing projects to pick from such as a felt stocking kit. If you have never attempted a sewing project or you are looking for a new craft based pastime then felt appliqué sewing kits may well be just the thing. Appliqué is a French term which broadly means 'to apply'. In appliqué sewing craft pastime kits you stitch together marked felt pieces and shapes to build them up into your completed item. As a pastime there are lots of advantages to felt appliqué sewing craft kits. All sets are ready supplied with all the pieces you would require to complete the project. All the constituent felt parts are already pre-marked to help you to cut them out at the start. It is easy to follow the instructions as you just need to clip out the parts and commence stitching them together. Some sections require you pack them with padding to form a three dimensional shape. All the requisite components such as beads, sequins and miscellaneous colored yarn is fully included so you are able to begin making your project right away. Working through the kit building all the parts together the user will own a beautiful ornamental item when completed. Of course if you are a novice at sewing felt craft kits it is wise to begin with a basic project kit. Basic kits are much less complex and will allow the beginner to naturally learn and advance with their sewing craft skills. As the user's skills expand they will want to tackle a more intricate fun sewing project. Some of the more advanced projects like the Christmas felt stocking kits can be quite involved with many parts to build together. In spite of being more difficult it is surely worth the extra effort as the final result is a striking iconic festive decoration that can be put to use for years. When given to a child or grandchild they may personalised with a name to make them an extra special gift item. Although many people see their hobby as an personal activity, sewing craft kits together can be a pursuit for yourself or as part of a group. It can be great fun sewing project after project as a family activity. Because projects such as the felt stocking kits have numerous parts each child or group member can help in putting it together. Alternatively, each person can make and accomplish their own sewing model and take pride in the finished piece. Kids will not only enjoy it but can learn the practical ability of sewing too. There are always lots of projects to choose from with a great variety of different patterns and styles. blossom. For a traditional festive decoration nothing can beat a Christmas stocking. You can even assemble them as a pleasurable gift for your beloved pet filled with all their favorite treats. When I first heard the term “bra pocket”, I thought it meant one of those money pouches women used to tuck in their cleavage. I was surprised and humbled to realize a bra pocket is a solution for women who have undergone a mastectomy. Having a mastectomy is a life-changing event, and many women require a long time afterwards to feel right about anything in their lives. Although, when ready to move on, you can still fill out your clothes like you did before the operation by using a prosthetic. Sewing a bra pocket provides a way to secure the prosthetic inside a fabric pouch, so it won't overheat your skin. To maximize your comfort level when wearing the prosthetic, use soft, absorbent, breathable fabric for the portion that touches your skin. I was going to write a step-by-step tutorial explaining how to sew a bra pocket, but I decided that my sources were so excellent, all I really need to do is provide the links and brief descriptions so you can find the tutorial that fits your needs. If you have any questions, or if you have problems opening the tutorials, let me know and I'll go ahead and prepare a tutorial to post here, with photos to help you with making the pocket. The first source is Threads Magazine, and their bra pocket tutorial describes sewing a flat patch that rests against your skin onto the back of your bra. You then slide the prosthetic into the pocket. prosthetic and then rests securely inside of your regular bra. If you are planning to take up sewing as a full-time career then you need to set up your very own space to accommodate your sewing needs and privacy. Your special place could be your kitchen or a separate room depending on your need for privacy. Having all your sewing needs laid out in a quiet corner of your house is not only appealing, but also convenient. When choosing a room for your sewing activity, you need to make sure that it's big enough to accommodate you and your sewing materials. It must have enough storage space like cabinets and drawers for your fabrics, threads, needles and ribbons. It's also a necessity to have a long table accessible on all sides for measuring and cutting; a comfortable chair or couch to sit on if you need to relax; a sewing machine, and finally an ironing board. Considering all these, you definitely will need a bigger room for a fully-operational sewing studio. Basic sewing studio layout and what's in it! When planning for a room to convert into a sewing studio, you need to take note of one aspect: convenience. You need to make sure that all of your sewing gear and materials are all stored in an organized way. First off, you need to put the long table in the middle of the room. Since you need plenty of space to move around as you stretch out the fabric, measuring and cutting out patterns. Once that's settled and done, you need to put in cabinets so that you can store all your fabrics and cloths for your sewing. Drawers with different compartments could be very handy for your ribbons, floss, bobbins, needles, scissors, laces and buttons. You might need multiple drawers for segregation purposes. Your sewing machine should be placed in an area where you have plenty of light and easy access to all your sewing materials. It was a common practice in olden times to place the sewing machine right under the window, not only would this location give you enough light while you sew, you can readily look out the window when you want to give your eyes a break. It's also advisable to have pegs placed on the walls to hang things like cloths, dresses, or clothes that you are working on. Not only does this reduce clutter, you won't need to iron them if they get wrinkled. A man-sized mannequin and a large mirror are both a necessity in a sewing studio. A mannequin allows you to design clothes and dresses with the proper curves that a man/woman should have; and the mirror is perfect if you want to test out how your designs would look. Carpets are a big no when it comes to designing your sewing studio. It's a general agreement among sewers that thick carpets are a nuisance rather than a comfort. It has been the case that a lot of things tend to end up on the floor as we sew like needles, pins, buttons, clips, etc. Try looking for a needle in a thick carpet. Most sewers advice a painted floor, especially dark colored ones like black, dark blue or even green which are convenient and not too expensive to clean. Sewing is such a hobby that is passed on from generations to generations. When it comes to sewing, many of us find it quite a use of free time whereas some others find it a learning experience. Whatever the quest is but sewing provides one relaxation and beneficial use of time which can in return save handsome money. Moreover a sewing project is a task which demands some handy skills as well as creativity. For those who enjoy sewing, it can be a wonderful way to make the thoughts in our mind come to reality. The biggest supports to your hobby are the sewing patterns, about which this article is meant to provide you more information with. Most of us involved in sewing are very well aware of the sewing pattern which puts down each unique design and allows you to sew from it like a pre designed template. Sewing patterns are so popular today that you can easily find any sewing pattern that you could ever think of is available in any one of the many fabric stores in most parts of the United States. Even if you are serious in finding your favorite sewing pattern you can easily lay your hands on them by visiting number of websites dedicated to selling fabric and patterns for online purchase. Sewing patterns can be used to make everything from clothes to pillow covers to curtains. With the help of sewing patterns you can create whatever you want for you or your home without much skill. That means whether you are a veteran or just starting out, a sewing pattern can help you organize your project. A sewing pattern is designed in such a way that as a beginner you will be perfectly sure where to cut, where to trace, and where to sew. If you really keen to begin with sewing but are not sure with complex sewing patterns, then there are simple sewing patterns that will guide you with step-by-step procedure through the task. One you get enough skilled with your sewing skills, you can take in more complex patterns that can assist in more complicated designs and projects. If you are interested in free cross-stitch patterns or quilt patterns or crochet ponchos patterns, then not only can you buy them online but can also procure them for free. Sounds amazing, but in reality there are many stores and online shops that offer the sewing and various other patterns for free. There is a large number of websites that not only provide you with free sewing patterns but also help you with valuable information on sewing patterns and other sewing projects. With many of the popular websites you can download the sewing patterns onto your computer to print later. Then there are various forums which are places you can join for free, and can interact with other sewing hobbyist to exchange information and resources ion sewing patterns. You will be able to ask questions and get advice. Looking for more information on Sewing Patterns check out http://www.blogger.com/“www.SEWING-PATTERNS.NET” your guide to Sewing Patterns. If you don't find a nice dress in the market, what do you do? You probably buy a fabric and go to a tailor so that he or she can stitch a dress that will suit your taste and flatter your figure. At times you may also do a little bit of embroidery work on the dress yourself. Well, if you know sewing, you can think of tailoring a dress yourself. What does a tailor do? He or she either designs and stitches clothes or alters them or repairs them. In most of the cases they have their own shops or they work in department stores. Some of them may also work from home. Well tailoring business is a good option for people who have enough spare time at hand and who like doing creative tasks. Besides it can help them to earn some extra money. If you are in a similar situation you can think of learning how to tailor clothes. Initially you may stitch your own clothes. Gradually you can enter this industry and spread the word that you are into this business. Learning how to tailor clothes is not a difficult task, especially these days, when you don't even need to go out of your house to attend classes. Several books are available in the market. Going through them will help you to learn the basic things. Besides you can check the online tailoring tutorials. Most of the tutorials are free. If you want to attend the advanced courses, you may opt for the paid tutorials. Though you can learn from the comfort at your home, it is always better to choose a local tailoring school or individual. This is important because if you don't understand any particular thing you can meet the teacher personally and clarify your doubts. So when you search for schools offering online lessons, look for local tailoring schools that offer offline classes as well. For example if you live in places like Pembroke Pines or Miami you should look for Tailor Pembroke Pines and Tailor Miami respectively. Once you choose an online course and buy reference books, it's time to start the process. Buy a sewing machine along with some sewing supplies. Since you are a beginner, a basic sewing machine will be ideal for you. A machine that can sew straight stitch, zigzag stitch, reverse stitch and can make button holes will be the right option for you. You should also buy a sharp sewing scissor and extra needles. Make sure you have threads in different colors. Another thing that you will need is a dressmaker's measuring tape. Measure a cloth twice before you cut it. Also become acquainted with the sewing machine before you start sewing a garment. When you start tailoring a cloth, you should wear eye protection because needle can cause accidents. Handle the needle carefully and keep the spare needles in a safe place while you work. These safety measures will help you to concentrate on your lesson. Hand-sewing is not a skill that's commonly taught anymore. To this day, my mom can't sew a stitch (not even a button!). I learned the basics in home economics, although these days they rely more heavily on machines to get a straight line and neat, even stitches. However, unless you want to become a very good customer at your local alterations shop (or toss your favorite shirt when it loses a button), you should at least learn the basics of sewing by hand. Here are a few simple techniques to get you on your way (who knows, you could become a quilting master!). 1. Running stitch. This is about as basic as it gets and it involves sewing in and out of the fabric in a straight line (to produce a sort of dotted line effect upon completion). Now, it may sound easy, but women of generations past prided themselves on their ability to sew these stitches so small and neat that they were practically invisible. If you're just starting, focus instead on keeping your line from wobbling. This stitch is good for seams. 2. Backstitch. This is just a more complicated running stitch. To accomplish it, you will start with one regular stitch (stitch up, then down) and when you come back up for the second stitch, instead of continuing forward, you'll go back through the previous down-stitch hole. Then you'll come up forward of the previous stitch, and go back again so that the effect (on the top side) is an unbroken line. It is like a reinforced version of the running stitch, but it's doubly important to get it straight. 3. Over-sewing. This stitch is really useful for fraying ends, but can also be used on a seam in a pinch. All you do is sew up (near the edge of the fabric) loop the thread over the top, and sew up again. The end result will be loop after loop of thread going around the outside edge of the fabric to hold everything in. 4. Whip stitch. If, like me, you constantly find yourself in need of a different hem length, you are going to love this stitch. It's sort of like a combination of the running stitch and over-sewing. To begin, you'll fold your hem to the length you desire (probably after you have torn out the previous stitching). Then sew into the edge of the hem and through the outside layer of fabric, and back in, making as small of a stitch on the outside as you can (the goal is to make it nearly invisible). Although the outside stitches will be very small, the ones on the inside of the hem will be fairly far apart (it might also be called tacking). This is sort of a quick and dirty stitch, but since it is unseen, you don't have to take too many labors to make it pretty. 5. Quilter's knot. 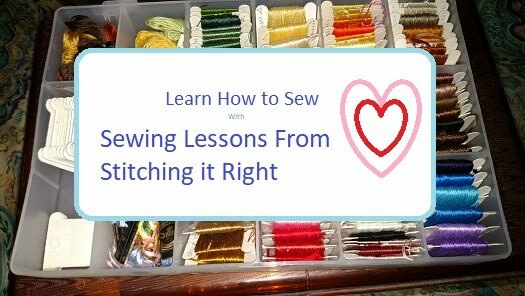 You may be wondering, when you reach the end of a line of stitches, how to stop your thread from going right back the way it came. To this end, a quilter's knot is extremely useful as it is a sturdy, simple, nearly invisible finishing technique. You just wrap your thread around the shaft of the needle three times, pull it tight, and then push the needle through the fabric (and the loops of thread). Pull it tight, or if the fabric is loose, pop it through to the other side. I've never entirely understood how this works, but I swear it does (although it might take a little practice to accomplish). Just mentally thank whatever sewing genius came up with it and use it often! Sewing is not only a great hobby and fantastic ceative past time it can even earn you some extra money. developing sewing skills is well worthwhile because they are a skill base which is growing in demand. As the old corner shop taylors have virtually disappeared people are finding it difficult to get basic sewing alterations done to their clothes. this is a market you can easily fill if you develop some sewing skills. Learning to sew will also give you the ability to totally transform your home furnishings and allow you to sew your own personality into them. You'll be able to take an ordinary pair of curtains and transform them into how you want, just adding small touches makes a huge difference. As well as home furnishings you'll be able to create shirts or dresses for yourself and your family, with sewing skills you can virtually transform any piece of material directly into how you like. It's really satisfying to produce your own clothes and to dress your children in clothes you have produced. The problem that confronts people new to sewing is which is the best sewing machine to start with. I have been asked this question hundreds if not thousands of times over the years from friends and students. And to be honest I can't pick out one machine and say this is the best sewing machine for beginners. it's just not possible, it can only be subjective. There's so many wonderful sewing machines to choose from on the market.Singer, Janome and brother to name merely three superb sewing machines. Which is the best sewing machine for beginners can only be a matter of opinion and we all have our views and opinions about just what is the best sewing machine. I can give you a number pointers to guide you in the right way, but in the end the choice will have to fall with you. To begin with I'd select a computerized sewing machine. These are the basic standard at this time and I firmly believe in staying up with technology. I really don't see the reason for training with older machines when you're able to learn on modern-day computerized machines. Some people would reason that it's far better to learn on older machines and move up little by little. This may be a sensible point, but is not one I agree with. If you're beginning from a blank canvas you might as well learn on a new computerized sewing machine with all the mod cons on it. If you learned on an older machine you'd quickly prefer to move to a much more sophisticated machine and take advantage of all of the computerized capabilities that simplify many tasks. So you may as well start on a computerized model. You wouldn't want to learn to drive in a 1920s ford would you? So why would you want to learn to sew on an old machine? The good news is that the price ranges for a good machine are really reasonable at the moment, and the features these machines have are amazing. You can do things on a small machine in your house today that needed much bigger machines not so long ago. Nearly all today's new sewing machines are computerized, whatever you can perform on a sewing machine is made easier due to computerization. You can even get embroidery machines that will instruct you step-by-step on the way to make things. The instruction occurs on the LED display screen. You need to be looking for a sewing machine that doesn't cost too much to start with. If you are just taking sewing up you can check out a second hand machine. The argument for getting a second hand sewing machine is that it's safer to shell out $120.00 on a second hand high-priced sewing machine than to invest $120.00 on a completely new but far inferior machine. This is an excellent strategy, although not one I agree with. A few years ago this might have been a very good method, however, the price of sewing machines has come down a lot and I think looking for a brand-new sewing machine is the best option. As you become a more knowledgeable sewer you will come to love particular sewing machines. The best way to select a sewing machine is always to ask yourself a number of questions. A newcomer will require a sewing machine with a number of fundamental stitches; every machine available will give you this. Typically the more stitches the sewing machine has got the more costly it will be. Think about what you are looking to do with the machine. Are you looking to create outfits, home furnishings, repairs, quilting or other homemade projects? For garments for instance you will want machine with a "free arm" this will make sewing sleeves and things like a whole lot of easier. Should you be looking to do quilt-making you will want a machine with a broader variety of stitches. If you are searching to do upholstery you will require a strong high quality machine. A low cost machine is not going to handle upholstery. How frequently do you think you will use the machine? If you plan to get into sewing in a major way you will need to purchase a more expensive machine that will endure heavy use. It's extremely hard to name a sewing machine and say this is the best one. I know people who swear by Janome sewing machines, stating they're the best sewing machines available on the market, others may swear by singer sewing machines, we all have our personal favourites. You can get an outstanding sewing machine for between $150 to $200. The more you're happy to commit the more you're going to get. 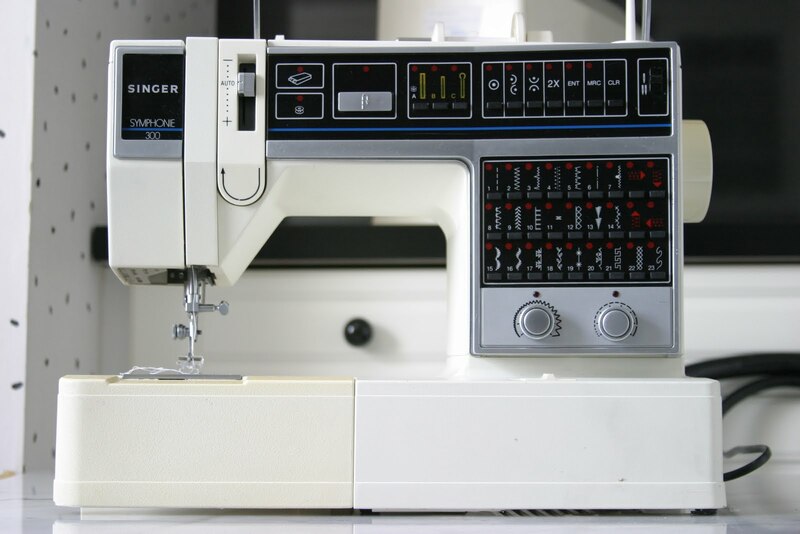 The first thing you need to do is get familiar with what a sewing machine does and learn about all the parts on the machine and what they do. Do your homework, possibly download some manuals. Singer has superb manuals that you can download and read. These will familiarize yourself with the parts of sewing machines. Sewing machine image courtesy of Med via Wikimedia Commons. Not every upcycling job is a major undertaking. You can turn the leg of an old pair of pants into a small tote bag with just a few sewing steps. Fold the top edge under twice, making sure the second fold is at least 1.5 inches. Sew close to the lower folded edge, but leave a one inch gap in the seam, making sure to backtack thoroughly on each end of the seam. Clip a bodkin or big safety pin on the end of an old shoe string or piece of nylon rope. Feed the bodkin or pin into the opening, and work it all the way through the folded and stitched casing. Remove the bodkin or pin, and tie the ends of the shoelace or rope together. Your tote bag is ready to go, giving you a new bag and keeping the old garment out of the landfill. Now what are you going to do with with the rest of the pants? How about a purse from the seat of the pants and grocery bag holder from the other leg? If you are looking for help with a canvas awning repair, check out our new Canvas Seam Repair page. You can either visit the page by clicking here, or via the tab at the top of this page. As always, feel free to leave comments or questions if you want to. You can save money on shoes to go with the great fashions you create and sew by visiting Tom's Shoes. Read about one woman's experience with Tom's Shoes by reading this toms shoe review. If you see anything you like, make sure to pick up the coupon code on the web page to save yourself some money! Learning to make "carry all" accessories is a geat way to get a bag that has the quality of a designer handbag, purse, or tote while only paying the price of a cheap bag. Obtaining a high quality designer bag is an exciting goal for many fashion consumers. Possessing a designer bag is both a status symbol and a source of pride. Fashionistas spend considerable time and money getting designer bags. Time is spent selecting the perfect bag, asking for outside opinions, and earning the money to buy the bag. There are even websites where visitors can post photos of an admired bag to get the opinions of strangers - so they don't waste their money on "seriously ugly" bags. Shelling out big money for a designer bag might seem worthwhile in some instances. Anyone who has, however, had the experience of a child or a pet getting sick on a purse or tote bag - or a pen leaking indelible ink - will probably not seriously consider paying top dollar for a handbag. Making a "designer" handbag, purse, or tote bag is a great way to get a high quality bag made in the perfect fabric without spending top dollar on an item that is easily ruined. A messenger bag is basically a tote bag with a couple of extra features like a zipper or storage pocket. Messenger bags are probably the easiest type of bag for a beginner to make. The lines are simple and the bag produced is versatile. Selecting a durable fabric or good quality leather will help to ensure the messenger bag will have the strength to be used for a long time. A really hesitant new sewing machine operator might want to start with a super easy drawstring bag or basic shopping tote bag. These are even easier to make than the messenger bag because they require no closures and no pockets. Purses and handbags are generally more detailed, with pockets and a lining. The extra features make them sewing projects for those individuals with a higher level of sewing skill – though it is not an impossible goal for someone beginning a sewing journey. It is easy to find sewing patterns that are designed for beginners because pattern makers label their patterns with information regarding ease or difficulty. Patterns labeled as easy make it possible for almost anyone to make their own designer quality handbags and purses at home. More advanced handcrafters might see a handbag and then make a pattern rather than purchasing one. This is actually much easier than it sounds for experienced sewing aficionados. It is simply not a task that is right for someone who is learning how to sew for the first time. Seeing a purse that is attractive and trying to copy it without a purchased pattern is basically making a knock off. The finished purse should look very similar to the original design if attention is paid to details. As long as the original is not actually used as a pattern the handbag will still be the unique creation of the person who makes it. Making a handbag also gives the maker the satisfying experience of designing and crafting a handbag with features that are "just right" and out of the perfect fabric to fit one's personal style. Sewing accessories like messenger bags, handbags, and purses is a fun, inexpensive, and satisfying way to obtain a designer handbag.